Calendar Kittens Attack Miller USA World Superbike! • Return of Troy Bayliss to World Supeike in 20011! Race winner Lorenzo congradulates Ben Spies on his first MotoGP podium. AirAsia British Grand Prix, Silverstone, Great Britain- Sunday 20 June - World Championship leader Jorge Lorenzo took victory from pole position at the AirAsia British Grand Prix at Silverstone on Sunday as he stretched his lead at the top of the standings to 37 points over Andrea Dovizioso, who placed second in the race. Ben Spies achieved his first MotoGP podium with third place. Lorenzo flew off from pole position as he and Dani Pedrosa (Repsol Honda) immediately engaged in a duel which saw them swap the early lead on the opening lap a number of times. Randy de Puniet (LCR Honda), Dovizioso (Repsol Honda) and Nicky Hayden (Ducati) were all involved as well, whilst Casey Stoner (Ducati) suffered misfortune as he dropped to dead last from his starting position of sixth as the riders entered the first turn. Marco Melandri suffered disappointment as he crashed out on the opening lap, but his San Carlo Honda Gresini team-mate Marco Simoncelli enjoyed better fortunes as he climbed positions. Lorenzo wasted little time in finding a rapid rhythm and by lap seven his advantage at the head of the race was a substantial one at over five seconds. Meanwhile Dovizioso and De Puniet ignited an intense contest for second spot, with Hayden hot on their tails. Monster Yamaha Tech 3 rider Spies was also making progress as he moved through to enter the top five and latched onto the chase for a podium spot. Spies moves within striking dstance of Dovizioso on the last lap. Midway through the race Stoner’s lap times were almost identical to race leader Lorenzo’s, but in eighth place he was forced to chase down Pedrosa and the Australian found it hard work trying to pass the Spaniard. He eventually managed to do so on lap 13, and then proceeded to make up further ground. Loris Capirossi’s race was ended early when the Rizla Suzuki rider crashed out at Copse as he ran off and fell whilst trying to overtake Héctor Barberá (Páginas Amarillas Aspar). At the front end Dovizioso, De Puniet and Hayden were separated by less than half a second as they continued their tactical tussle for the final two podium spots – Spies keeping a tag on as well – with Lorenzo’s lead by now an unassailable one. With three laps to go Hayden and Spies both managed to pass De Puniet, and Stoner scented the chance to get in the hunt. He soon made a move on the Frenchman to slot into fifth in a rousing finale. The final lap provided a fitting climax as Spies got through on Hayden at Farm Curve to take third spot, a position he held to the finish whilst ahead Lorenzo crossed the line first. Dovizioso’s second place was his fourth podium finish and best result of the season, with Spies completing the top three for a first Grand Prix podium. Ducati duo Hayden and Stoner took fourth and fifth after fine individual rides, with De Puniet sixth. Rookie Simoncelli took his best premier class result to date with seventh, as Pedrosa finished eighth. The top ten was completed by Colin Edwards (Monster Yamaha Tech 3) and Aleix Espargaró (Pramac Racing). Absent from the race was Hiroshi Aoyama (Interwetten Honda MotoGP) who attended hospital to assess his condition following a crash in the morning warm up session. World Champion Valentino Rossi (Fiat Yamaha) also remains out whilst he recovers from his broken right leg. Jorge Lorenzo - 1st, 41'34.083 - "This was an important day for me and an important win, because I felt so strong and I enjoyed riding my Yamaha so much. I had a different feeling today; I felt that it was going to be a good race. It was quite hard to be fast at the start and the first lap with Dani was difficult, but once I got past him I felt very relaxed and comfortable. I thought he would follow me for a bit longer but he didn't and then I was on my own, so I just had to focus on myself; I didn't even know who was behind me! I never dreamt of taking three wins from five races but here we are and I am feeling very strong mentally at this moment. I want to thank my team, Yamaha and Bridgestone for this victory. The Beatles celebration was something fun for the fans, I love their music and I thought it was nice to make a homage to them, since we're in England!" Ben Spies - 3rd +7.097 sec. - "I didn't expect to get my first podium so quickly, especially after yesterday which wasn't the best for me. I got a decent start but once I got by Dani and Simoncelli I just tried to stay on the back of the group battling for the podium. Once I realised I could stay in contention I just tried to save the rear tyre as much as I could and it all worked out. The last few laps I pushed as hard as I could and made some good passes and it is great for Yamaha and the Monster Tech 3 Team. I'm also pretty happy about it too and this is good for my confidence. That last lap was difficult to pass Nicky but I got a really good drive onto the back straight and tried to pass him at Stowe Corner but he came back by. On the next straight I managed to get by him and then had to ride quite defensively on the last part of the lap. I was on the edge but I had to go for the podium and it worked out. It will be hard to duplicate this but right now I'll let it sink in and make the most of it. But on this day I can say I was the third best rider in the world and it is a good feeling." 11 EDWARDS 26, 12 BARBERA 24, 13 ESPARGARO 22, 14 AOYAMA 18, 15 KALLIO 15. Jules Cluzel celebrated the first win of his World Championship career after a stunning Moto2 race, riding his Forward Racing Suter to victory ahead of Thomas Lüthi (Interwetten Moriwaki Racing) and Julián Simón (Mapfre Aspar). From the start Fonsi Nieto (G22 Holiday Gym) flew up to third from tenth on the grid as he wasted no time in pushing his way forward, and with the pack tightly bunched on the opening lap there were a pair of fallers as front row starter Stefan Bradl (Viessmann Kiefer Racing) and Simone Corsi (JiR Moto2) – third in the Championship standings before the race – collided and crashed out. The Forward Racing pair of Claudio Corti and Cluzel, who started from the front two spots on the grid, became embroiled in a battle with Nieto at the head of the race, a fight which Simón soon became involved in as Nieto’s challenge faded shortly after. Cluzel, Corti and Simón threatened to become slightly detached at the front as the scrap for fourth involving a host of riders took place, but Lüthi and Scott Redding (Marc VDS Racing) – who had fallen to 17th after the start – began to regain ground as they swallowed up track behind the trio. Lüthi’s superb pace meant that by lap 12 of 18 a gap that had stood at almost two seconds to the front three had been diminished as he and Redding caught the leading group, making for a fantastic final third of the race which became a marvellous five-way contest. Former 125cc World Champion Lüthi pushed his way to the front as he rode an unforgiving and admirable race and with two laps to go Corti crashed out as he lost his Suter bike going through Turn 8, the entry to the chicane approaching Club. The Italian returned to the race to finish 30th. The final lap provided great drama and as Lüthi ran wide going into the corner where Corti had crashed shortly before Cluzel went through on him to take the lead, holding it until the finish line to take his debut World Championship win. Lüthi and Simón both took their second podiums of the campaign with second and third places respectively, with Redding achieving his best result of the season so far with fourth in his home GP. Debón, Shoya Tomizawa (Technomag-CIP), Mike di Meglio (Mapfre Aspar), Xavier Simeon (Holiday Gym G22), Dominique Aegerter (Technomag-CIP) and Championship leader Toni Elías (Gresini Racing Moto2) completed the top ten, as Yonny Hernández (Blusens-STX) and Alex Baldolini (Caretta Technology Race Dept) both crashed out on the final lap. 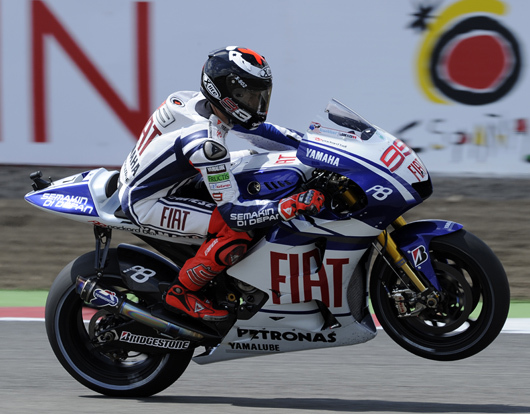 Elías remains at the top of the Championship standings on 80 points, with Tomizawa still second on 65. Lüthi climbs to third on 58, with Simón and Corsi both on 51 in fourth and fifth. 13 REDDING 18, 14 NIETO 17, 15 AEGERTER 15. You haven't heard of her yet, but you will be very soon. Beautiful Australian songwriter/singer Catie Cole was born and raised in the city of Melbourne where she spent all her life until the fall of 2009. That's when she moved to Los Angeles to record her debut record. And that's were Calendar Show producer Jim Gianatsis found Catie playing in a small club with our own favorite signer songwriter and actress Elizabeth Nicole. "My earliest childhood memories are of my mother blasting Led Zeppelin, Rolling Stones and The Beatles, and my father with his Maria Callas arias and other classical music he would play," explains Katie on how she was exposed to music from an early age. "For my sister and me, sitting around the piano singing show tunes with “Opera Dad” was a regular occurrence, followed shortly by sitting with my Mum and watching 20 minutes of concert footage of Hendrix, awaiting the “best guitar solo ever played”, according to her. As crazy as it was, I guess it all went in subconsciously. As soon as I considered myself old enough, I started booking myself into clubs with a guitarist and playing gigs. When I commenced doing paid gigs in venues, I was quite young and simultaneously this is when I began to hone my skills as a songwriter too. During the day I would write songs and play gigs at night, covering songs from some of my favorite artists like Sheryl Crow, Marvin Gaye and Janis Joplin. This was my life. Soon, I was legally allowed to be in the venues my agents booked me into (fancy that) and as I owned all my own music equipment and amps, anytime there was a gig, I would grab a guitar in one hand, boomerang in the other, hop into the pouch and ride my Kangaroo to work. Right before I left Melbourne, on average, I was performing acoustic gigs 3-5 times a week at 3-4 hours a pop by myself. All the gigs helped me to realize that with music, I didn’t just want to be “weekend warrior”, so to speak. Although I had been busy focusing on being a singer, I now, more than ever wanted to share the other side of me, the songwriter, with a larger audience. It was time for a new chapter. At some point during all my vegemite eating and dingo racing, I got a surprisingly good email from a welcome stranger. One of my favorite record producers, Howard Willing, sent me an email after stumbling across some demos on the web. He was interested in working with me and possibly recording 3 or 4 songs. I thought it was a joke at first, but after many hilarious phone/email conversations later (please imagine montage of chatting, packing suitcases and taxi to the airport to the happenin’ 80’s sounds of “Maniac” – Michael Sembello), I leapt forward and booked flights, car and hotels on my own dime to see if we would all work well together. I landed in Los Angeles where we recorded 4 songs so fast and with so much ease, that everybody agreed that I would fly back later in the summer to finish the record. But as of now, I'm still here in Los Angeles!" The net high point of Katie's short music carrer came this past February whern she opened on stage for legendary singer songwriter Glenn Campbell at the Riverside Casino Auditorium in Laughlin, NV. Just imagine her thrill to open the Show for one of America's biggest recording stars, from a period 10 years before she was even born! Now, Katie has put a band together, which conviently, also includes members from the Sara Haze band which had already been booked to headline this year's 2010 LA Calendar Motorcycle Show & Calendar Girl Music Festival. So it was was a no-brainer we had to sign Kate to this year's Show lineup as well, together with Elizabeth Nicole, regular Calendar Show favorites the all girl AC/DC tribute band Whole Lotta Rosies, and the Purrfect Angelz dance show. Things are now really moving fast for our vegemite songstress, who is now contemplating if stilettos are really appropriate footwear for running, or maybe she needs to be riding a racebike like fellow Aussie and Fast Dates Racebike Calendar stars Troy Bayliss, Troy Corser and Casey Stoner. Aussies like to do things a little differently, be it on the racetrack with a Superbike or on stage at the Calendar Girl Muisc Fesival with a guitar. All of Ducati's factory and support riders were on hand to meet the fans at WDW2010. Click to GO BIG. Misano (Italy), 14th June 2010: Testing concluded this evening for the Ducati Xerox team and riders Noriyuki Haga, Michel Fabrizio and Troy Bayliss. 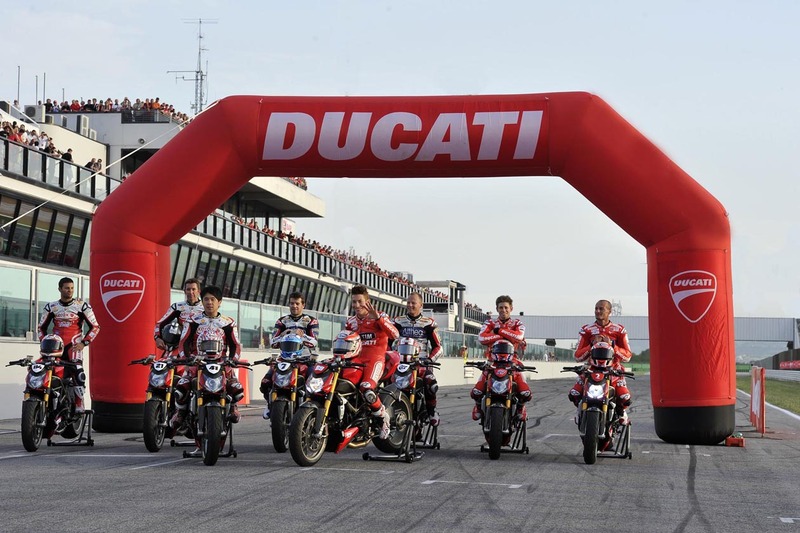 The three-day test session took place on Thursday, Sunday and today, with the first two days of testing coinciding with the first and last day of World Ducati Week, allowing the huge crowds of Ducatisti to witness an official testing session first hand. Noriyuki and Michel were on track on their factory 1198 bikes while Troy Bayliss, testing for the second time this season, rode the development machine, aided by Ducati’s Superbike development team under the guidance of Ernesto Marinelli who, as well as undertaking the role of Team Manager, acted as Bayliss’ race engineer once more on occasion of the tests. Also present for the tests were other Ducati privateer teams including World Superbike outfits Althea Racing with riders Carlos Checa and Shane Byrne, the DFX Corse riders Lorenzo Lanzi and Regis Laconi, as well as the Supersonic Racing Team with Italian rider Luca Scassa. Also in attendace for World Ducati Week which was taking place at the same time at Misano were the Marlboro Ducati MotoGP riders Casey Stoner and Nicki Hayden. The three Ducati Xerox riders completed five hours of testing on Thursday, registering some very fast lap times, maintaining a good rhythm despite the very hot conditions (which didn’t drop below 30°C air and 40°C track temperature). By the end of this first day, Michel had recorded the fastest unofficial time of the Ducati Xerox riders, stopping the clock at 1m36.2. During Sunday afternoon’s session temperatures were slightly lower but a light rain shower interrupted the short session. Both Noriyuki and Michel made some consistently fast laps and were satisfied with the progress made (while Bayliss elected not to ride). Today’s test was private, with the WDW event having closed yesterday, and all three riders were on track all day, alongside private teams Althea Racing, DFX Corse and Supersonic. Pirelli provided some new tyres for Noriyuki, Michel and Troy to test but tyre test aside, most of the work involved preparation for the Misano SBK round, in which Noriyuki and Michel will participate at the end of this month. The team was satisfied with the times set, Bayliss 1m35.6, Fabrizio 1m36.0 and Haga 1m36.4, and return to the factory in Borgo-Panigale in a positive state of mind. Troy Bayliss - “The testing’s gone really well and with more time on track today the times improved quite a bit this morning. I’m happy with how it all went and hope my feedback can help Nori and Michel, but I’m also tired because we’ve had a lot to do during this edition of WDW, both on and off track! 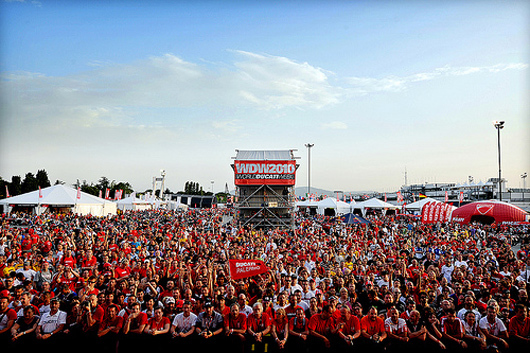 World Ducati Week 2010 Sets Record Attendace of 60,000! Bologna, Italy (15 June 2010) - World Ducati Week, the massive event that unites and excites the Ducati community, has wrapped up after four days with a record-breaking attendance of 60,000 motorcyclists. 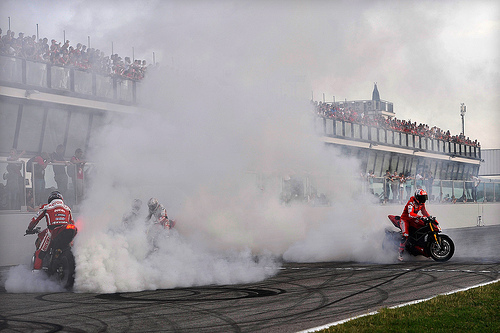 Held at the Misano World Circuit, the celebration - entitled the ‘Red Planet Returns’ - took June 10-13th and become one of the best ever in the event’s history. 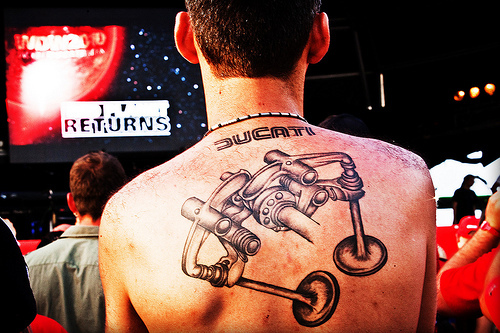 While Italian Ducatisti made up 60% of the total attendance at WDW2010, the remaining Ducati fans and attendees travelled from 28 nations and five continents- underlining the international appeal of the Ducati brand. Owners from Europe, America, Australia, Russia and India united with those from Brazil, China, Malaysia and even Gabon and Nepal to celebrate their passion for the Ducati brand. The event peaked on Saturday, June 12th when the program of events climaxed with a spectacular knock-out drag race competition, featuring Ducati MotoGP and Superbike riders aboard the asphalt-ripping Ducati Streetfighter S. True to form, the eight riders – Battaini, Bayliss, Byrne, Checa, Fabrizio, Haga, Hayden and Stoner - put on a fantastic show from the moment they left the pit garages, playing to the crowds that filled Misano's paddock terraces. World Superbike Ducati Xerox Team rider Noriyuki Haga won the photo-finish final- just fractions of a second ahead of Ducati MotoGP team rider, Nicky Hayden; followed by Troy Bayliss in third position. The packed four-day program provided both entertainment and interaction for the 60,000 visitors, including events on the track and courses in the “Ducati University” presented by Ducati engineers, riders and managers from the Italian manufacturer. While the Italian Air Force helicopter aerobatics display provided an incredible show in the air, stunt shows, vintage bike shows, motocross freestyle displays, dragsters and race track demonstrations by the Ducati Xerox Team provided the same on the ground. The event also staged concerts by four Ducati Bands, chosen from a list of local artists submitted by Ducatisti in the run-up to the event. Misano, Italy June 10th - Since 1967, NCR of Bologna, Italy, has built very exclusive performance motorcycles based on Ducati motorcycles and engines. NCR continues this trend with its latest introduction premiered this month at WDW2010, of a truly exclusive and technologically advanced Ippoliti Designed NCR Millona 16 or simply the NCR M16. It's the Ducati for the Ducastisti who has everything, including a fat bank account. Starting with a production Ducati DD16RR MotoGP V-4 cylinder MotoGP derived engine, the NCR M16 utilizes the latest carbon fiber and titanium to create a clean and flowing design with functionality as its main criteria. We can see the family evolution of the NCR Millona One Shot air cooled motorcycle in the lines of the new NCR M16. The NCR tradition of unmatched power to weight ration continues to be the main driving force in the design and development. Upon closer inspection, you will note that this is no ordinary motorcycle. It was conceived from the start to be the most exclusive motorcycle in the world by using the strongest and lightest material in the world. By carefully developing every single component to be as light and strong as possible while achieving the very best performance. WIthout gas, the NCR M16 achieves an incredible weight of 145 kg (319 lbs). Since there are no rules to follow, the weight is actually lighter than the imposed minimum weight of a MotoGP motorcycle ( Including no silencers, no lower fairing, no CARB certification and a smaller fuel tank). To achieve this weight, NCR designed and developed its own carbon fiber frame while improving the air intake system by allowing an unobstructed flow of air through the steering head. Again with the goal of achieving the lightest weight and the strongest performance, NCR developed a new swingarm in carbon fiber as well. The fuel tank, faring, subframe/tail, fender, front faring stay are all carbon as well. Even the NCR wheels are been dsigned and manufactured in carbon fiber. All mechanical parts are either titanium or avionic grade aluminum with material grades derived from Formula 1. This is of course in the NCR tradition. The motor develops over 200 horsepower at the rear wheel. WIth the latest generation MotoGP suspension in front and rear, the racing heritage continues. Also the brakes are from the highest racing application. The NCR M16 uses its own electronics derived from racing with full traction control, data collection and recording, 3 user selectable maps, as well as constant fuel remapping based on environment and gas conditions. The Fast Dates Calendar Kittens heat up the track at Miller World Superbike! The Making of the FastDates.com Calendars now on DVD! Sure, we may be slow getting around to some things, one of those being the re mastering of our infamous Making of the FastDates.com Calendars movies from VHS tape to high definition DVD. But now thanks to the help of Amazon.com we've entered the 21st century and you can stuff into your Computer or Big Screen DVD player the fastest, hottest, wettest, sexiest motorcycle movies ever made! The making of the FasDates.com Calendars DVD movies are available from Amazon.com and in the FastDates.com Video Store. 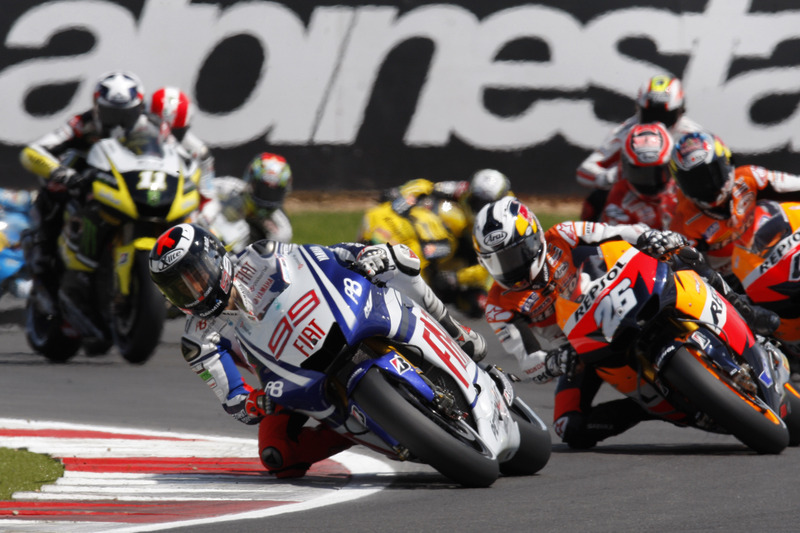 Silverstone June 20th - Jorge Lorenzo ran away with the British Grand Prix at Silverstone this afternoon, storming home to win by 6.743 seconds to take his first UK win in the Premier Class. The Fiat Yamaha Team's sole representative in the absence of the injured Valentino Rossi, Lorenzo led from the first lap to come home ahead of Andrea Dovizioso and Tech 3 Yamaha rider Ben Spies, who took his maiden podium in MotoGP. The Mallorcan got a strong start from pole position and led out of turn one but it was not all plain sailing as he became embroiled in a feisty first-lap battle with Dani Pedrosa. The pair traded the lead several times but it was Lorenzo who eventually led over the line and he was unchallenged from there on in, gradually extending his lead lap-by-lap and leaving his rivals trailing in the wake of his blue and white M1. With two laps remaining the gap to Dovizioso stood at more than eight seconds but Lorenzo slowed down on the final two laps to ensure he came home safely, which he duly did to the delight of the 70,000 British fans who are quickly adopting the spirited Spaniard as one of their own. His third win of the season and another 25-point haul extends Lorenzo's lead to 37 points over Dovizioso in second, with Pedrosa now third. The absent Rossi falls to fourth in the championship but Lorenzo's consistency ensures that the Fiat Yamaha Team still leads the Teams' standings and Yamaha the Manufacturers'. The MotoGP paddock now faces a quick turnaround in order to get to Assen in time for next weekend's Dutch TT, which is as always a Saturday race. "This was a great performance by Jorge. The start was a little bit interesting, with us on the hard Bridgestone and some of the others on the softer one, but Jorge rode so well, kept his head and brought it home safely. Our bike is working very well and it was great to see Spies taking a podium on the Yamaha too, well done to him. It is impressive to have a 37-point gap at this stage but now we have four more races in very close succession so we can't relax. Well done to Jorge and to everyone for today." Silverstone June 20th - Ducati Marlboro Team's engineers did an excellent job in this morning's warm-up to put Nicky Hayden and Casey Stoner in a position to challenge for podium finishes in this afternoon's British Grand Prix. They missed out for differing reasons - Stoner paying the price for his bad start, leaving him in last place in the first corner - and Hayden making just a small mistake on the final lap to concede third place after fighting throughout the race for second. Stoner made up ten positions to take fifth place but lost too much time when held up behind Dani Pedrosa to make a decisive attack at the end. VITTORIANO GUARESCHI Team Manager - “Even though we didn't make the podium I think both Nicky and Casey had a good race today. Casey paid the price for a very bad start when the bike jumped as he let the clutch out but he put together a great fight back and only missed out on the podium because he ran out of time. Still, he made ten overtakes in a very determined performance. Nicky also paid a heavy price for the only small mistake he made at the end, missing the podium as a result, but he was up there again at a new circuit, working well with the team to find a good set-up. This exciting new Soulful Pop Rocker will knock your socks off! Click to hear and order Sara's latest CD! The best motorcyce racing movie ever made! Filmed on location at World Superbike, this an exciting romantic drama staring beautiful actress Sienna Miller. June 24th - Yamaha Motor Racing is pleased to announce that Wataru Yoshikawa, their experienced Japanese test rider, will join the Fiat Yamaha Team from the Barcelona round of the MotoGP World Championship. The two-time Japanese Superbike Champion will ride in the place of the injured Valentino Rossi, with Rossi's team and the YZR-M1, until the Italian is back to full fitness following his broken leg. It is expected that Yoshikawa will be with the Fiat Yamaha Team for at least three races, after which more should be known about Rossi's expected return date. Lin Jarvis, Managing Director of Yamaha Motor Racing Srl, said "we have considered many different scenarios and candidate riders to fill the temporary vacant seat in the Fiat Yamaha Team. We had always planned to use a rider from within the Yamaha Motor and Tech 3 family but for each rider we considered who is in active competition, their move to the Fiat Yamaha Team would have created another problem for their own racing program or for the teams in which they are engaged. Finally, after a great deal of consideration, we have selected Wataru Yoshikawa, our Japanese YZR-M1 Test rider, to join us as our substitute rider. We provisionally plan for three races (Catalunya, Sachsenring and Laguna Seca) but we will adjust the plan accordingly when we know more about Valentino's expected date of return. "The benefit of Wataru's presence in our team will be threefold. Firstly he brings with him a wealth of experience riding the YZR-M1. Secondly his presence allows us to fulfill our contractual obligations and to join the team's quest to accumulate points for the Team Championship. Thirdly he will gain valuable first hand MotoGP race experience in three challenging circuits which will surely be very useful to assist him and Yamaha with the future development of the YMR-M1. "We look forward to welcoming Wataru into our team while we wait for Valentino's return to full fitness." Wataru Yoshikawa added "I'm happy to have this chance to stand-in for Valentino while he is recovering and to compete in MotoGP again for the first time since 2002, when I raced at Motegi. Looking at the Fiat Yamaha Team results with the 2010 YZR-M1, I can see that the winter developments were correct and now I am looking forward to having the chance to gather some ‘real racing' data, which will be very helpful for the future development of the M1." PICKERINGTON, Ohio -- Despite what we remember from our teen years, sometimes a good lecture is just what we need -- especially if it's about motorcycles. And you'll find plenty of cool lecture topics at the Mid-Ohio Sports Car Course in Lexington, Ohio, July 9-11, during AMA (American Motorcyclist Association) Vintage Motorcycle Days. Front and center at the lectern during AMA Vintage Motorcycle Days will be numerous historical figures and industry leaders hosting seminars ranging from riding to racing to restoring vintage motorcycles. School was never this good. "The seminar program at AMA Vintage Motorcycle Days is one of the most popular features at this event," said AMA Special Events Manager Tigra Tsujikawa. "Not only do we feature those who have helped write the history of motorcycling, but we include current experts from various fields and disciplines. Topics as diverse as international off-road competition, getting started in vintage racing and practical tips for creating custom bike parts will be coverage." All seminars are roughly 90 minutes in duration and are in the Goodyear Tower on the fourth floor, or in the AMA Motorcycle Hall of Fame Tent in the infield of the Mid-Ohio roadrace course. Several seminars will focus on the 2010 Marque of the Year, Husqvarna. Located at the Hall of Fame Tent, these include "Husqvarna Motorcycles: The People Behind It All" by Gunnar Lindstrom on Friday, July 9, at 10:30 a.m., and "The Early Years of Husqvarna in America," featuring John Penton, Lindstrom, AMA Vintage Motorcycle Days Grand Marshal Malcolm Smith and Tom White on Saturday, July 10, at 1 p.m. Fans of off-road racing will get a real treat on Friday at 2:30 p.m. and Sunday, July 11, at 1 p.m. in the Hall of Fame Tent when the 1982 International Six Days Enduro U.S. Trophy Team will re-unite for a discussion about their all-Husqvarna effort that brought home a second-place trophy that year -- the highest finish a U.S. team has ever achieved in this storied international competition. The discussion will feature Mark Hyde, Mike Melton, Terry Cunningham, Scot Harden and Wally Wilson. Also featured will be Bridgestone Motorcycles, the 2010 Classic Club, in talks by Randy Gibbon and Larry Young on Friday at 11:30 a.m., Saturday at 9 a.m., and Sunday at 11:30 a.m. Speaking at the Goodyear Tower, Gibbon and Young will discuss both the high-quality and little-known history of this rare brand. Perennial AMA Vintage Motorcycle Days speaker Craig Vetter returns this year to discuss motorcycle streamlining and fuel economy. Vetter will present his ideas and lead an open discussion at the Hall of Fame Tent on Friday at 1 p.m. and Saturday at 10:30 a.m.
Running in conjunction with the AMA Racing Vintage Grand Championships, AMA Vintage Motorcycle Days is known by many for its National Championship vintage competition in motocross, trials, hare scrambles, roadracing and dirt track. For those interested in getting started in the sport -- certainly one of the least intimidating and most affordable ways to get on the track -- vintage racer, promoter and sponsor Don Miller will offer advice in "How to Get Started in Vintage Racing" on Saturday at 3 p.m. in the Goodyear Tower. Two other major highlights of AMA Vintage Motorcycle Days are the bike shows and North America's largest swap meet. Both, of course, inspire attendees to take on motorcycle projects of their own. If you want to do it right, you won't want to miss Bob Vail's "Building Vintage Motorcycle Specials: Techniques and Tips." Vail will discuss working with Fiberglas, welding and aluminum castings to make custom parts on Friday at 10 a.m., Saturday at 12 p.m. and Sunday at 1 p.m. in the Goodyear Tower. Triumph fans can get their fill of technical information on Friday at 2:30 p.m. and Saturday at 10:30 a.m. when Triumph experts John Healy and Don Hutchinson will discuss the details of working with the classic British brand. Eric Trow will address motorcycling safety in "Ride Like It's 1969 Classic Lessons for Riding Safely Today" on Friday at 1 p.m., Saturday at 1:30 p.m. and Sunday at 10 a.m. in the Goodyear Tower. In addition to these seminars, there will be ample opportunity for the public to interact with Grand Marshal Malcolm Smith and other AMA Motorcycle Hall of Famers who will be in attendance. Held at the world-class Mid-Ohio Sports Car Course, AMA Vintage Motorcycle Days features vintage and post-vintage competition in motocross, trials, harescrambles, roadracing and dirt track. In addition to demo rides of current production bikes, the event includes North America's largest motorcycle swap meet, educational seminars, bike shows, the Federal Companies/Allied Used Bike Corral, motorcycling seminars, the new product Manufacturers' Midway, and club corrals featuring marque and regional clubs. Proceeds from AMA Vintage Motorcycle Days benefit the AMA Motorcycle Hall of Fame. The goal of the Hall of Fame, located on the campus of the AMA in Pickerington, Ohio, is to honor the distinguished men and women whose competitive spirit, passion, vision and entrepreneurship have played a vital role in shaping the sport, lifestyle and business of motorcycling. For more information, call (614) 856-2222, or visit the Hall of Fame's website at MotorcycleMuseum.org. For tickets to AMA Vintage Motorcycle Days, see MidOhio.com. For more information about the event, visit AMAVintageMotorcycleDays.com. June 20th - Yoshimura Suzuki team rider Blake Young crashed at the recent Barber test and was left with lingering back issues, which have now been diagnosed as crushed or compressed vertebrae. This can be a very serious injury and others who have suffered severe cases have been warned not to ride until the area is fully healed. Blake's riding coach Kevin Schwantz canceled his trip to Silverstone MotoGP last week and instead flew to Madison to be be with Young. They then traveled to California, where Young is seeing different doctors including Dr. Art Ting. Young's absence may give the Yoshimura team an opportunity to race Australian Josh Waters who has been testing with the team as a future prospect. Awesome color photography of the riders, bike and racing action. Commerating the 22nd Anniversary of World Superbike featuring American Ben Spies' 1st World Championship Title. Plus a technical look data all the bikes, a preview of the 2010 Championship! Motocourse Race Review Annual 2009 - 2010! Official MotoGP book, the second edition of this practical guide to motorcycle racing technique, aimed at racing and track day enthusiasts at all levels, has been expanded to include extra information as well as many new photographs and up-to-date quotes from MotoGP stars. Earn 50% Referrals as a FastDates.com Affiliate!